According to their website, “Monk Fruit In The Raw — a sugar substitute made with the sweet vine-ripened monk fruit, which is native to Asia. Along with Stevia In The Raw, Monk Fruit In The Raw is leading a new sweetener revolution, providing Americans with all-natural, calorie-free alternatives to traditional refined white sugar.Made with real fruit, Monk Fruit In The Raw is a delicious and wholesome sugar-alternative that has a clean sweet taste, zero carbs and fewer than 3 calories per serving”. I’ve been a fan of their Stevia in the Raw, but the Monk Fruit version was better and had a more natural taste. Loved it. To learn more, and find out how to get free samples and a coupon, click HERE. There is also a option to search for local retailers who carry it. Interesting product… I’ve tried to just go sugar free but sometimes I really want a little sweetness in my iced tea. Thanks for the heads up. I’m allergic to Stevia like throat closes allergic. 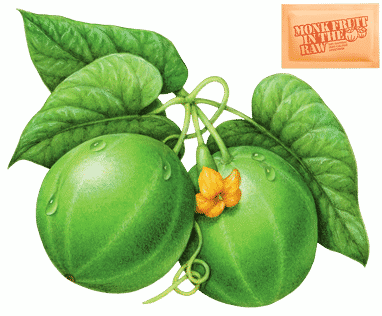 I’ll have to look for this monk fruit but since my scare with Stevia I’m a little leery.